Both were huge hits, but only one of the two would go all the way to number 1. At the top of the singles chart this week in 1992, Richard Marx spent a third week at number 1 with "Hazard", but his days were numbered thanks to this week's high-flying debut. "Beauty And The Beast" was still in the top 20, but Celine found herself just outside the top 50 once again with her latest solo single. This one was written by big ballad queen Diane Warren. Back in 1977, the combined might of this double A-side single was enough to send it to number 8. In 1992, this latest re-release wasn't as well received as "Bohemian Rhapsody". The consistently unlucky Australian rock band peaked short of the top 50 for a third and final time with this track that appeared on EP Dateless Dudes Club. It was a battle of the mullets in this single from Time, Love & Tenderness, which charted 15 months after lead release "Love Is A Wonderful Thing". And yes, that's Teri Hatcher in the video. 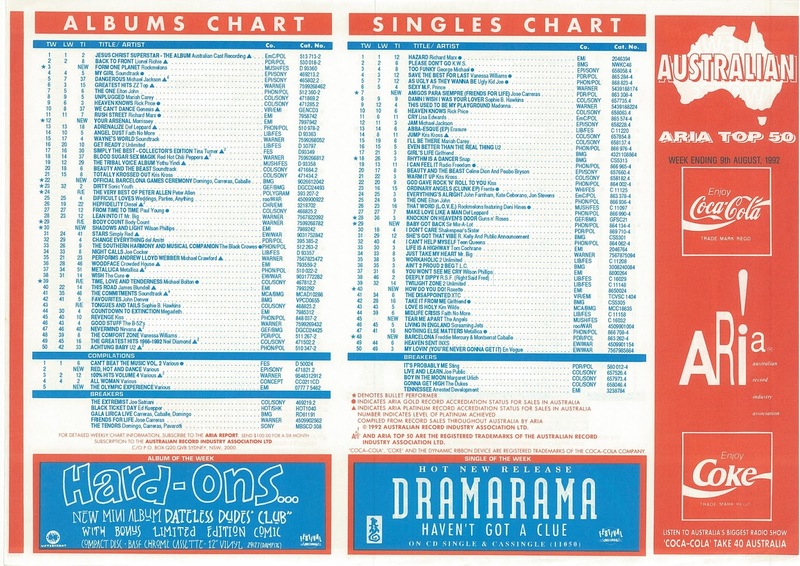 Someone was very keen on making a success out Dramarama in 1992, with the American band featured as Single Of The Week for the second time in two months, but unlike "What Are We Gonna Do? ", "Haven't Got A Clue" didn't manage to crack the top 100 at all - and I have a feeling this was its second time being released. The latest Queen re-release might've tanked, but it wasn't the only old song featuring the late Freddie Mercury on the top 100 this week in 1992. This 1987 duet with opera singer Montserrat Caballé was re-released to coincide with the Summer Olympics in Barcelona. The song named after the host city had actually been written with the Olympics in mind and was performed by Montserrat (with a backing track that featured Freddie's vocals) at the opening ceremony. The pop star and the opera soprano actually recorded an entire album together, also titled Barcelona, which would be Freddie's final solo work before passing away in 1991. It normally goes the other way, but each of The Angels' three singles from Red Back Fever peaked 10 places higher, with "Tear Me Apart" improving on the number 43 position achieved by "Once Bitten Twice Shy" (which in turn had out-performed the number 53 non-hit "Some Of That Love"). Also worth noting (and giving me cause to breathe a sigh of relief after having been forced to recap so many songs by the band these past five years) is that "Tear Me Apart" was The Angels' last ever top 50 appearance. Roxette's imperial phase had well and truly ended when the final single from Joyride, "Church Of Your Heart", failed to make the top 50. But the Swedish duo bounced back with yet another top 20 hit - their 10th - with this lead single from Tourism. Or, to give the band's fourth kind-of studio album its full title, Tourism: Songs From Studios, Stages, Hotelrooms & Other Strange Places. Yes, the band were clearly in demand all around the world and cobbled together an album as best they could while on the fly, but in between its confusing concept and the songs not being quite up to standard, perhaps it would've been a better idea to hold off and not rush something out. To be fair, "How Do You Do!" is not so bad - it's got that catchiness Roxette were known for - but it's not one of my favourites of theirs. And nothing else from Tourism ventured in to the top 50. "I like big butts and I cannot lie." 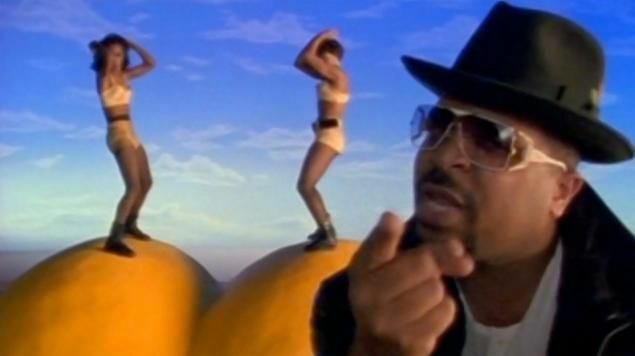 With those words, Sir Mix-A-Lot provided a voice for people who like a bit of junk in the trunk and aren't turned on by the types of stick-thin, bottom-less women normally seen in magazines, on TV and in films. The rapper (real name: Anthony Ray) wrote "Baby Got Back" due to that under-representation of fuller-figured women and helped bring some diversity to the types of body shapes seen in popular culture. And, because it was a catchy rap track about huge butts, it was (rather appropriately) massive, reaching number 1 in the US and the ARIA top 10. Although it was Sir Mix-A-Lot's only hit single, "Baby Got Back" has never really gone away, continually referenced and sampled since 1992, most recently by Nicki Minaj on her 2014 single "Anaconda", which also reached number 8. Next week: the ARIA chart gets yet another makeover, plus the debut of a hip-hop group that had an amazing successful start to their career. Heh! I guess when they decided to call their band the "Hard-Ons" they probably weren't expecting Top 50 success…not that they would've cared. Oh no! I know what you're referring to there with "Amigos Para Siempre" coming back. Oh no. I don't think I've heard it since 1992, but I thought the 'return' of the song was actually an improvement. Well, the only way was up! Oh man, when this one gets recapped, I hope I don't have the urge to click the video link! That other version charted? I did not know that! Battle of the Mullets! I wonder who dreamed up that Kenny G/Michael Bolotin crud. Either way, some fat git in a suit at Ca$h Money Records got rich with a tastey lil' earner like that! LOL!!! Oh, except it stalled at number 61. Whatevs. Freddie Mercury is a legend though. I had to cheat and look up my charts for this other version that you mention. Aaahh!! Excellent. Love it. I saw in my copies of the ARIA Report a few months back that 'If You Asked Me To' was released here on the 1 June 1992... so it took more than 2 months just to crack the top 100! I strongly associate it with listening to the tail end of American Top 40 that year, waiting for UK Chart Attack to begin. It's funny how Celine (and Mariah) were initially marketed/styled to appear older than they actually were, followed by a complete reversal a few short years later. 'Missing You Now' is another slice of early 90s dreary MOR destined for high rotation on TT FM (those in Vic will know). Michael seemed to have a number of singles that peaked here at either #60 or #61. The Dramarama song is better than I was expecting. But I can't say I was ever swayed to check out something heralded as 'single of the week' on the printed chart. 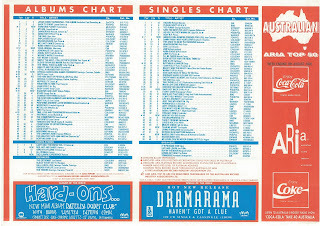 After checking with a sometime commenter on your blog, 'Tear Me Apart' was another heavily discounted release, and was also used in a National Drug Offensive ad, which, if I remember correctly, aired contemporaneously with the single's chart run, despite the uploader's 1989 and 1993 claims (clearly the former is wrong). That probably explains why it peaked higher than the previous 2 singles from the relative flop parent album. I always thought 'How Do You Do' was objectively crap (the nonsensical lyrics and Per's flat vocal delivery)... but somehow it works/is catchy. But still it's hardly their best. I thought their next single was quite good, so of course it flopped. About 5 years after finishing high school, I went out to dinner with someone I hadn't seen since, and in her car on the way there, 'Baby Got Back' was playing, and, to my surprise/amusement, she knew all of the words and sang/rapped along to it; such is the song’s enduring impact. Now 'Amigos Para Siempre' was something that was truly crap. I thought it was a joke when it debuted at #5, let alone the time it spent at #1. I can't picture any demographic it would appeal to who would buy singles. I guess they must have. I didn't think "How Do You Do" was all that bad but yeah, the lyrics are pretty naff. Come to think of it that goes for most of their songs. I always associate that song with "Wayne's World" for some reason. I don't think there's anyone old enough to remember music from 1992 that doesn't know every word of the first verse from "Baby Got Back". Ditto "Ice Ice Baby", come to think of it. I agree with you on 'Baby Got Back', but she knew the whole song! As did I, of course, but I wasn't expecting that from her. Of course I meant debuting at #7 for 'Amigos Para Siempre'. Just wondering about Amigos Parro Simpere here, it says the closing ceremony was on August 9, and this is the week of August 9, so I wonder why we were only seeing the song debut now. Surely they'd have released it before the opening ceremony 2 weeks prior, so it would then hit its mark when the Olympics were in full tilt. Of course we know it went to #1 and stayed there, yada yada. But you'd think some coke sniffing marketing exec would've been on to this. Good question. This chart is dated for the week ending August 9 (i.e Aug 3-9), so it would've been published at the start of that week and based on sales from the week or so before that, so it probably was released to coincide with the opening ceremony (or even slightly before that). Oh yeah and I forgot to mention about the Roxette song How Do You Do, do what me and my high school mates used to do and sing the chorus in a 'stereotypical Californian bimbo' voice. It actually improves the song I reckon! "How dyewww yeww dyeww, dyeww yeww dyeww, the things that yeww dyewww, no one I know could evah keep up with yewww…." and so on. Good fun. Try it on a rainy afternoon when you have nothing better to do.